Suggest links or significant fossil finds (localities/assemblages), or contribute images to the Paleontology Portal. 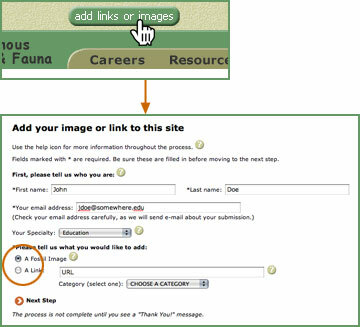 Click on the “add links or images” button at the top of any page, and then fill out the form. All submissions go through an editorial review process  see the editorial policy for more information. Submit names, supporting information, and photos of important North American fossil finds that are significant because of the quality of preservation and/or the importance of the fossils in understanding evolution and life of the past. Contribute images from any taxonomic group. All fossils must have been collected in North America.